Camping season is here and it’s time to hit the road. But before you do, check all your RV safety stuff to make sure it is in proper operating condition. Every RVer should know what safety devices are available on their RV, and understand how to use them. Most RVs regardless of what type or what size it is will come equipped with several different safety devices. 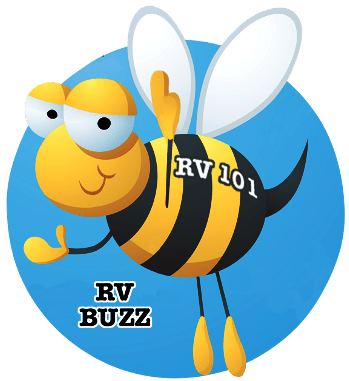 RVs come with fire extinguishers, LP gas leak detectors, smoke alarms, emergency escape windows, and in many cases carbon monoxide detectors. Fire Extinguisher: Let’s start with the fire extinguisher. Every RVer needs to understand the different types or classes of fire extinguishers and how to properly use a fire extinguisher. Teach everybody that will be in the RV to remember the word PASS. This is an easy way to remember how to use a fire extinguisher, especially during an emergency. PASS stands for Pull, Aim, Squeeze and Sweep. P– Pull the pin located at the top of the fire extinguisher. A– Aim the nozzle at the base of the fire, not at the flames. S– Squeeze the handle or trigger, standing approximately 8 feet away from the fire. Release the handle if you want it to stop. S– Sweep the nozzle side to side at the base of the fire until it is out. Observe the fire to make sure it does not re-ignite. Note: Check the individual fire extinguisher for the distance you should stand from the fire. Different extinguishing agents require different distances. Inspect your fire extinguishers every 30 days & before each trip. Look to see if the arrow is pointing in the green area in the sight gauge. If it reads empty or needs charging replace it or have it recharged immediately. Inspect all components of the extinguisher to make sure it is in proper operating condition. Inspect the safety pin, handle or trigger, sight gauge indicator, inspection tag, hose or nozzle, tank, and labeling. Every month you should turn dry powder extinguishers upside down, tap on the bottom of the extinguisher and shake it so the powder that settled on the bottom is released. If the powder is packed in the bottom of the extinguisher it may not discharge properly, or at all, when you need it. Extinguish any open flames, pilot lights and do not smoke, or touch electrical switches. Evacuate the RV and turn off the main gas supply valve. Leave the door open and do not return to the area until the odor clears. Have the system checked out by a qualified technician before using it again. False LP gas alarms can be caused by hair spray, perfume, cleaning solvents and low battery voltage. When ever you have the LP gas refilled or when stopping to refuel the RV all LP gas appliances should be turned off and the main gas supply valve should be turned off. Smoke Alarm: A properly working, battery operated smoke detector is critical. Test the alarm mechanism prior to each trip you take to make sure it is working properly. Change the batteries when you change your clocks twice a year. If you remove the batteries from any safety device while the RV is in storage remove the device from the wall or ceiling and place it where it can easily be seen as a reminder the next time you use the RV. If you or anyone else experiences any of these symptoms get to fresh air immediately. If the symptoms persist seek medical attention. Never use the range burners or oven as a source of heat. These LP gas appliances are not vented outside and because of the limited space inside the RV the lack of oxygen can lead to asphyxiation. When you do use the range top burners or the oven for cooking use the range vent fan and/or open a window. Have an emergency escape plan. RV’s come equipped with an emergency escape window. Make sure everybody knows where the escape window is located and how to use it. It’s a good idea to practice using it so you are familiar with how to get out of the RV in case of an emergency. Vintage Trailer Restoration - 17 Episodes on DVD Mark's RV Garage Award Winning 17 Episode Series presented by RV Education 101: Mark and his son Tyler decide a "fixer upper" project would be fun, but soon discover their project trailer would require more than a few weekends to complete. Follow the epic 7 month-long fun educational and entertaining journey as Mark and Tyler demo the vintage trailer down to the frame and then rebuild to its former glory. 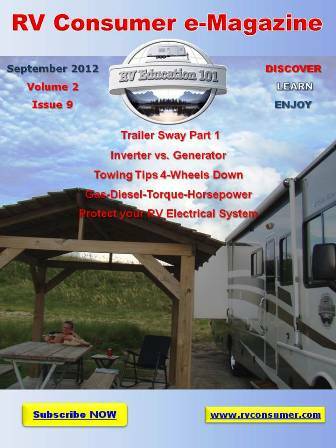 Are You Maximizing The Life of Your Tow Vehicle? Should I Start my Motorhome when it’s in Storage?